Load Bar 36 inch long – 4H portable load bar Kit for livestock, farm, animal weighing with digital display. Brand New 36 inch long heavy duty weigh Bar. Easy to read display. Both weigh bars handle over 10,000 lb capacity with 1 lb sensitivity. Great for Alley way or simply use it under any frame pallet. Hard wood or metal position them if it is permanent both bar include ears with 1/2 holes that you can use to secure them to your permanent structure. It is easy to move with handles installed. Handles also fold away while it is not in use. All parts are industrial powder coated steel heavy material. Both bar has a quick disconnect cable coming out that plugs into the back side of the indicator. None Slip rubber feet threads into the load cells, leveling is easy with hole on top of the bars as threaded stem has a slot for flat head screw driver. Indicator display with lead acid battery and AC adapter. Display works anywhere, show in direct sunlight, view it from an angle. Also comes with a clear in-use cover to protect against dirt, easy to clean, easy to use. Indicator comes with “U” bracket for easy mounting. Detachable by removing the side knobs. Both cable has quick disconnect to move bars into different locations. Inside the weigh bars individual connection boxes eliminate loose box to dangle around. Weighs in both Lbs & Kgs. Capacity is set to 10,000 lb with 1 lb sensitivity. Each bar 36″ long x 4.5″ wide heavy powder coated steel. 2 x 15 ft cable from junction box to the display. 4 x rigid rubber feet none slip for easy leveling adjustable for uneven surfaces. Bars stand on their own makes it easy to position them. Indicator operates on rechargeable battery and/or AC adapter plug (both included). Front panel keys are. HOLD, UNIT, TARE, ZERO, PCS. 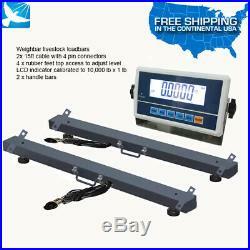 I ndustrial heavy duty electronic weigh scales. They mount easily under any cattle squeeze, hog crate, feed hopper, or home manufactured custom platforms. Load bars are environmentally coated for outdoor installation. There are no moving parts to wear out, and no costly maintenance. A safe overload range of 150% of capacity. Indicator display use it either pounds (lbs) or kilogram (kg). The exclusive lock-on feature locks onto the animal’s weight, eliminating the problem of animal movement during the weighing process. Clear in-use cover to protect against dirt easy to clean, just wipe it off. Install the scale, press the Zero button, and you’re ready to weigh. All Scales comes pre-calibrated your frame/weighing surface can be easily zero off for weighing. 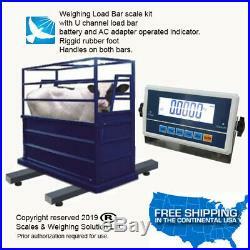 The item “Livestock Load Bar kit Cattle Hog Goat Sheep Alpaca Pig Farm Scale SWS. 36-4H” is in sale since Wednesday, March 27, 2019. This item is in the category “Business & Industrial\Agriculture & Forestry\Livestock Supplies\Animal Health & Veterinary”. The seller is “theloadcelldepot” and is located in Hialeah, Florida. This item can be shipped to United States.